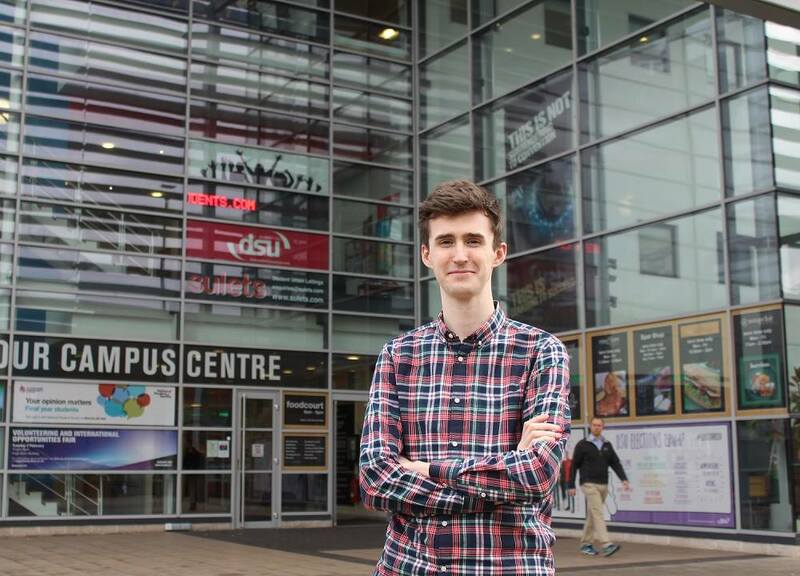 Journalism graduate Jonathan Whitney has found himself back on the De Montfort campus, returning to the university in a role at De Montfort Students’ Union as Media and Communications Coordinator. “All of the skills I’d learnt on my course were big factors in me landing the job, but my previous experience was crucial. In my final year of study I was a Frontrunner in the press office at DMU, and the skills I learnt there in sourcing and writing news stories more tailored to a commercial setting was really important, and it was most helpful to me in learning how to write for different audiences. “I work in a small team, so I can find myself turning my hand to anything during a normal working week. I coordinate all of the news content that goes up on the DSU website, most of which I write myself. I’m also in charge of all of the main social media channels we have, so scheduling messages for, and monitoring, Facebook, Twitter, Instagram and others can take up a large part of my day. “Right now is a really busy time because we’re in the middle of planning comms. around elections, Varsity, RAG week and a whole lot more. But I’m really enjoying it!